Combined PoW/PoS (proof-of-work/proof-of-stake) algorithm was one of the most important proposals in the original GRAFT white paper. After getting some real-life experience with running the mainnet since January 16th, and based on feedback received from multiple miners and potential supernode owners, the GRAFT team realized that there is big difference between “combined” and “coupled”. The proposal of the “combined” PoW/PoS was in fact “loosely coupled” PoW/PoS. The problem with coupled PoW/PoS is that the PoW power is mostly consolidated in a few large pools, which limits the ability to create a large number of independent full supernodes. This process of consolidation happened very fast because 1) we use CryptoNote/CryptoNight protocol which is very well known in miners’ community and 2) our project received good attention and massive support of miners community, with many miners spending significant resources to contribute to the network hashrate (which is great!). 1. “Decouple” PoW and PoS, so the full supernode will require only the stake (PoS), effectively eliminating the requirement to mine a block in order to run the full supernode. The full supernode will only require a stake (50,000 GRFT) in order to be eligible for processing RTA. We modify the authorization sample selection algorithm so instead of looking at recent mined blocks it will compare the hash of the supernode’s PoS wallet with the hash of the last mined block (height – 30). The main idea here is that the selection is random while the result is deterministic for anyone who calculates the formula. The Tx fee is still equally distributed between the members of the authorization sample; the miner also receives the share of the fee. 2. Introduce 4-tier stake model where a higher tier has a greater chance to be selected into authorization sample, while the selection process is still random. Each tier participates in a random selection of 2 sample supernodes (a total of 8 full supernodes). Thus, naturally, tier 4 supernode has more chances to be selected due to the limited number of tier 4 supernodes. “Empty” spots are filled by the higher level tiers (or lower in absence of higher). This algorithm is also adaptive as it will “regulate” the average number of full supernodes on each level. 3. Allow delegated stake. Balances from multiple wallets can be “delegated” to a single full supernode in order to form a stake significant enough to run a full supernode. The earnings are distributed between the wallets according to their stake share. Minimum balance for delegated stake is 5,000 GRFT. 4. Introduce 2-tier transaction fee. The RTA (“instant confirmation”) Tx fee will be set to 0.5% of Tx amount or 0.01 GRAFT, whichever is greater. RTA transaction is used for real time point-of-sale purchases, in store or online, similar to credit/debit card payments. The regular (“slow”) transfer fee will remain the same: 0.1% or 0.01 GRAFT, whichever is greater, for micropayments (Tx amount less than 1,000 GRFT), and Log(1000) of Tx amount – for Tx amounts greater than 1,000 GRFT. This transaction type is used for transfers between accounts, similar to ACH bank transfers. Although these changes may resemble some existing implementations of PoS and masternodes, GRAFT solution is still a unique combination of most private blockchain protocol (CryptoNote), advanced principles of PoS and multi-tier networks, and new approach to crypto payment processing with features like low Tx fee, the fee charged to the recipient, functional separation between the Wallet and Point-of-sale apps, various retail transaction types, service brokers, and more. GRAFT development team has already started design and implementation of all the features and changes above. 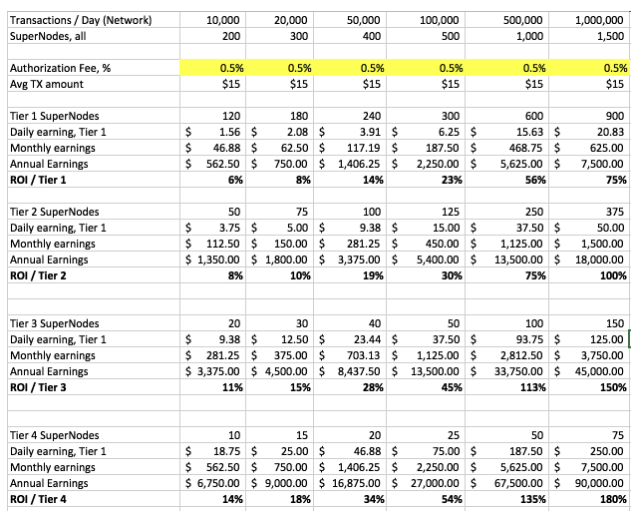 As can be seen from this calculator, the full supernode income depends on 1) number of transactions in the network, 2) number of full supernodes in the network, 3) average transaction amount, and 4) the stake tier of the full supernode.